Yesterday we saw fist hand the condition of a single school in rural Guangxi, today we’ll be getting the bigger picture of the state of education in rural China, and some of the systemic problems. Even Global Times (a State run paper) says that “Knowledge no longer power for rural poor“. Currently the majority of primary and secondary teachers in rural schools do not have 4-year degrees. These statistics though do not capture the full problem, as it does not account for the divide between rural areas in the east and west of China (the Eastern parts are much richer). For many of my students in Guangxi, none of their teachers prior to college would have attended a 4-year school. Primary school teachers would be less educated as well. This means that children in the countryside start further behind their urban counterparts. Rural schools also lack modern equipment and facilities. This means that most rural teachers still lecture for the majority of the class. Students also remain cut off from materials that may spark an interest in learning. In Ningxia province 17% of primary schools and 15% of middle schools do not even have libraries, so it should not be surprising that the average scores on the English portion of college entrance exam in the province are half of what is required for China’s major universities. Another study showed that virtually every rural school teacher had used physical abuse in their classroom. 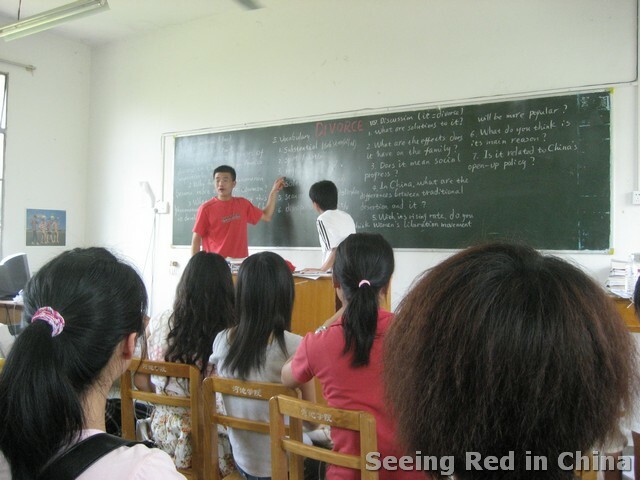 These teachers are rarely punished for their actions as I showed in my post “Abuse in rural China“. The major cause of this gap is due to a significant lack of funding for education. While China’s goal is to invest 4% of the GDP in education (world average is 7%), many provinces fall short of even that low bar. Through the 80’s and 90’s national funds were targeted at developing education on China’s east coast, and local governments (the lowest level), were responsible for funding local schools. These local gov’ts diverted funds (and still do) to projects that they thought would give them better returns on their investments. Rural schools were so short on funding that teachers were often paid in locally produced goods, like baijiu and cigarettes, and left to resell them. Good teachers fled as fast as they could. This resulted in a major rural/urban gap in education. By the late 90’s it was clear that major reforms were necessary, and the responsibility of funding these schools moved up one level to the county gov’t, and national funds were to be more evenly disbursed. Provinces were also supposed to facilitate the transfer of funds to their poorer regions. Yet, major problems remain. Poor counties still are expected to educate students with incredibly limited resources. In rural areas salaries usually make up 80-90% of their budgets, and the remainder is spent on classroom supplies. This results in crumbling buildings, where teachers are left to scrounge for chalk and erasers so that they can use their blackboards which are actual boards painted black (I know this from personal experience). Without proper funding, it is hard to imagine the countryside ever catching up with the urban areas. China must once again re-evaluate its policies, or doom millions to substandard education, and a bleak future. By T in Education on August 26, 2011 .